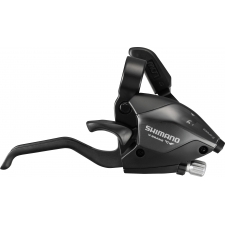 Dyna-Sys 10-speed shifters with Vivid indexing and Multi and 2-Way release to exceed the demands of ever changing bicycle designs and riding styles. Light to the touch but positive and crisp, Vivid indexing provides a constant amount ofshift lever force across all 10 sprockets. 2-Way release: the upper lever still performs the same shift function, but it can now swing in either direction allowing it to be released by the thumb or index finger. Multi Release allows multiple gear changes from both levers with one sweep, further adding to the speed of shift. Multi-bearing design uses two ball bearing units to provide a low-friction and reliable shifting action. 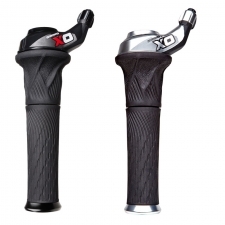 One piece lower alloy thumb release lever increases durability and givessharp precise shifts. For use with Dyna-Sys 10-speed only. Raised optical gear display instantly shows you what gear you're in and allows clearance for suspension lock out clamps below. Multi-position adjustable handlebar clamp for custom lever positioning. Can be adapted using ISpec mounts to fit directly to XT M785 brake levers. 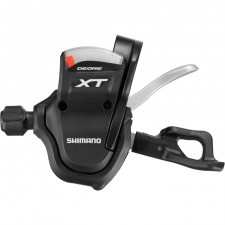 Buy your Shimano XT 10spd Gear Shifters, SL-M780, Pair from Revel Outdoors.